We are seeking all-stars to help support our expanding services to families at our South Waterfront Ronald McDonald House. This is a weekly role, with ~2-hour shifts in the evenings, once or twice a week using an RMHC vehicle. 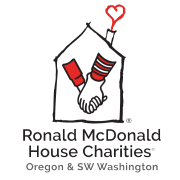 Ronald McDonald House Charities of Oregon and SW Washington provides a "home away from home" for families with seriously ill children, and supports initiatives to improve pediatric health.